Board our air-conditioned bus to discover the main neighborhoods of Paris. Recorded audio guides in several languages will give you a glimpse into the history of Paris and its finest monuments that symbolize France. The City Tour also takes you through the Place Vendôme where the greatest jewelers are, past the Comédie Française and the must-see Louvre Museum, over the famous Pont Neuf, and through the lively Saint-Germain-des-Près area. You will also pass the Place du Châtelet, the Conciergerie and Notre-Dame Cathedral on the Île de la Cité, as well as the esplanade of the Paris City Hall. The tour continues over the Place de la Concorde before heading to the Champs-Elysées. At the start of the great avenue, you will see the Petit Palais and the Grand Palais. 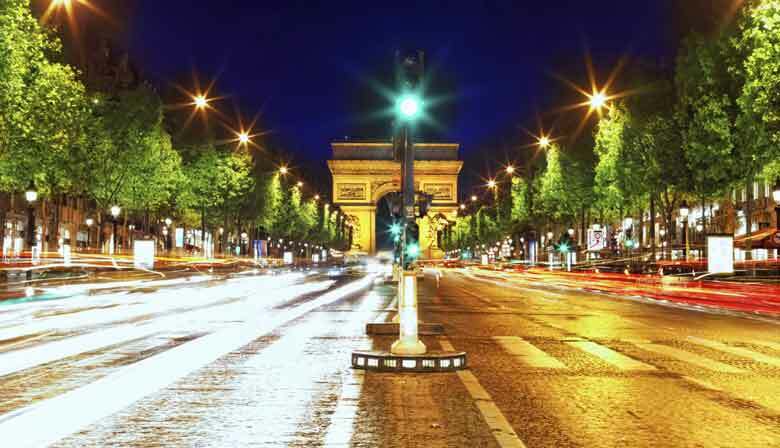 As you go up the Champs-Elysées, you will see the Arc de Triomphe towering above the avenue. The bus then drives to the Eiffel Tower to admire the impressive Lady of Iron before taking you past the Invalides and its golden dome, the Madeleine church and the Opéra Garnier. With this 2-hour tour in a panoramic bus, you will discover the main neighborhoods and monuments of Paris and will dive into the daily life of Paris people. You will listen about the history of the City of Lights and the evolution of its architecture throughout the centuries. You will find your bearings in Paris and understand how Parisians perceive their own city. The Paris tour ends towards the Montmartre neighborhood, dropping you off at the legendary Parisian cabaret, the Moulin Rouge. The Moulin Rouge team will welcome you and show you to your seat to watch the “Féerie” show. You will be carried away by the show with its troupe of 80 performers, including the magnificent Doriss Girls in their costumes made up of feathers, rhinestones and glitter. In this music-hall mecca, you will see the sumptuous decor of the various tableaux bathed in an ambiance of magic and nostalgia: The Pirates and their mysteries; the Circus with clowns and acrobats; the Moulin Rouge of 1900 to ... paying tribute to the women of Paris and the famous French Cancan, not to mention astonishing international items with exceptional performances. Sip a glass of Champagne while you watch the Moulin Rouge show. Afterwards, you will be taken back to your accommodation in Paris. Would give it a 5, but told that we would be dropped near where staying. But we’re dropped at nearest metro-15 min walk at 1:30am. The tour guide provided us with a private tour with exactly what we wanted to see. She even stopped so we could take night time photos of the Eiffel tower. The show was wonderful. There were a few different acts that we never expected to see at a dance show and one of them made our evening. I think we will be talking about it for a while but I will not write what the act is here not to spoil the surprise. Would have been excellent in an open top bus. Absolutely fabulous,best show have ever seen. Was worth travelling from Australia to see the show. Everything is good! Thank you very much! Simply perfect! Suggest getting the dinner and show combination for the best experience. The city guided tour was very good. The guide Mr Jose was well informed, polite and took good care. The Moulin Rouge show also was excellent.